The SEGA Addicts need your listener questions for episode 35! Tonight is the official recording of episode 35 and that’s not even a joke! I may seem like I’m joking but I’m not. I’m dead serious. Just look at my face. 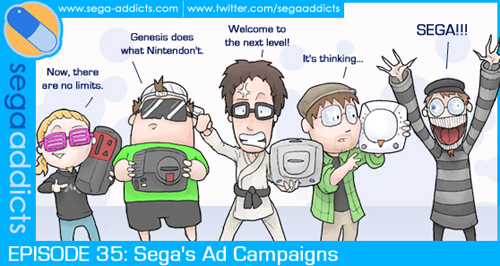 Anyway, tonight’s episode will be about those SEGA ad campaigns we all know and love. Mainly we’ll be focusing on the console ad campaigns but I’m sure some game specific advertisements will creep in there as well. We’ll also be doing the usual SEGA news and upcoming releases because that’s how we do things around here. Now, it may sound like we have the entire episode under control but the truth is we do not. We have a listener questions segment at the end and we need your questions and comments to make it a success! Just leave those things in the comments below and they will be asked or scrutinized by yours truly. And they don’t necessarily have to be related to the main topic of tonight’s show as we love all questions big and small. Phantasy Star Online 2 gets many new Screenshots! Here’s a question. Are there any imported Sega games any of you got? If so, which games and why? You know I used to be teased alot back in Jr. High days for my Sega-love. Too bad the person I borrow the Game Boy from, (one of my friends) ended up getting stolen at school and I had to give up my Sega Genesis w/ Sonic 2 (it just came out at that time) to him. Oh the tears. – Tell us your first experience with a Sega-related item, and the joy… or disappointment it brought. – Any of you still have a Sega 32X/Sega CD/Saturn or any of Sega-related consoles? (excluding the Dreamcast.) Yes it can be even the first model Genesis. – Did you ever at once desire to get a Super Nintendo instead of a Genesis? And if you did, what game(s) (yes that’s plural as in one or more) and why? – Random question: What made you love Sega more then anything else? (Because they didn’t sell out like Rare did?) Give your reasons and explain why. Y’all ever eat pie? Whats the best pie? This question is a little bit of Disney related and mostly it is from SEGA. With Disney now distributing Iron Man 3 and The Avengers movie, do you guys think that SEGA will be able to afford, and I do say it because on Yahoo games they reported that Iron Man 2 didn’t sell well, the license to do a possible Iron Man 3 video game? What about the Thor video game, are you guys excited to see this license come back in a solo title for the first time besides with his appearances in games like Marvel Ultimate Alliance and Marvel vs. Capcom 3? Poo. I wish I wasn’t at work all day to come home and find this topic pointless for my time of entry. Is anyone else as perplexed as I am as to why Sega continues to do movie tie-in games since those types of games today are usually ho-hum regardless of the producers?